Fil-Tec’s unique patented knitted wicks are made in America. We have innovated the best capillary flow in the industry today. 100% Natural replacement for zinc core wicks. Self-trimming replacement for less stable braided cotton/paper wicks. A line of wicks developed for use in taper, pillars, votives, sticks and tea lights. A gentle curl that is self-trimming and reduces afterglow. Our Candle Makers know the most important decision is wick selection. We designed our manufacturing process and quality system with product performance and consistency as our top priorities. This unique manufacturing process allows us to make the wick faster, more efficiently and above all more consistent than traditional braided wick. Our patented knitted wick construction and manufacturing process assures our wick is more consistent from spool to spool than other candlewick. We understand the time required to classify a new wick for your products. We also realize that your time represents a significant investment. 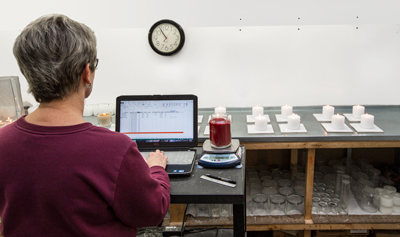 Fil–Tec has put together a testing facility that is staffed by a dedicated group of individuals with many years of combined candle industry experience. Using your defined performance criteria we will test your wax blend samples and recommend a wick that will both improve your product’s performance, and lower your costs. Working together we are confident that we can improve your candles, lower your costs and give you the piece of mind that only the most consistent burning wick can provide. Every candle maker is unique in the way they produce their candles. From the type of candle to the wax blend and scent; they are all different. If you need additional information on our candlewick products or just have a question please fill out the contact form below or give us a call at 1-800-258-5052. We will respond quickly to your inquiry.